Have you already claimed the fantastically-talented, -entertaining, and -versatile actor Alan Tudyk–star of Joss Whedon vehicles like Serenity, Firefly, and Dollhouse–as your personal hero? As I expressed when I profiled the Twilight Is Gay t-shirt, I’m no fan of bigotry. * But I do heartily endorse literal descriptions of vampire franchises featuring lots of unnaturally-pretty, sensitive, shirtless men when it’s to the chagrin of legions of irrational–and often creepy–fangirls (and fanmoms). I’m on Team Tudyk, baby! * I heart you, gays! But just as friendsies! Via Reddit, who was way ahead of you on the Tudyk fan curve. 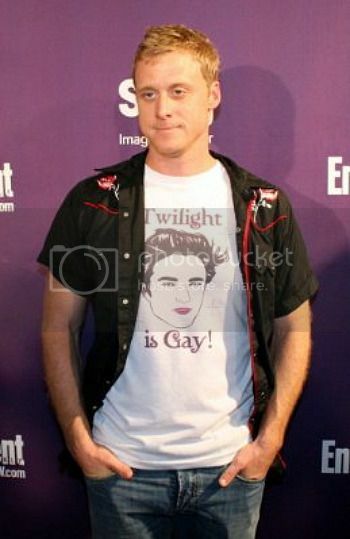 I totally love Alan Tudyk, no homo. Well, I’m homo, but my love isn’t. Wait. No, seriously, I’m gay so I’m allowed to say that Twilight is some f—-t s–t (I have f-word privileges). You forgot star of Broadway’s Spamalot! Now if we could just get the networks to stop killing him off on every show he appears in! But seriously, maybe Alan could get a recurring role on Castle as head of CSU – they always mention it but never show it. After the Halloween episode, we know they’re Firefly fans. hey alan.. i just wanna say that: I LOVE YOU.! !